Welcome to the website of Hajee Mohammad Danesh Science and Technology University (HSTU) which is the first Science and Technology University in the northern region of Bangladesh. It stands away from the urban din and bustle at a beautiful and scenic location some 13 km north of Dinajpur town by the side of the intercity highway that links Dinajpur to Dhaka, the capital of Bangladesh. I feel great pleasure in expressing my heartiest congratulations and best wishes for the gradual but steady development of the HSTU, Dinajpur. It is a matter of satisfaction for us that the university has made steady progress in a relatively short period of time in terms of expansion of its physical infrastructure and academic programmes. The HSTU has been growing rapidly in terms of quality, recognition, activities, number of courses, student intake, staff, outreach and research during the recent years. The university provides multidiscipline education. We have eight faculties such as Agriculture, Computer Science and Engineering, Business Studies, Fisheries, Engineering, Veterinary and Animal Science, Science, Social Science and Humanities and one Post-graduate Studies. Now we have 44 departments under nine faculties including post graduate studies. Presently 195 international students (undergraduate-179 and postgraduate-16) are studying in this university; they are from Nepal, Bhutan, India, Djibouti, Nigeria and Somalia. We are proud for our international students as the number is the highest among the public universities in Bangladesh. In the continuing task of nation building, HSTU is trying to promote excellence in higher education for a vibrant and inclusive society through knowledge creation and dissemination. It is making sincere efforts to contribute its mite by providing the right kind of human resources. It is striving hard to impart quality education to meet national and global challenges, towards accomplishing its mission. For students, the degree represents certification of competence, and a passport to advanced education or gainful employment, and livelihood and prosperity. They have an important role to play in the development of the nation and hence have to handle their future with confidence and capability. 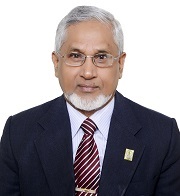 As a Vice Chancellor, my main objectives are to produce quality human resources to conduct fundamental as well as advance and applied research to solve both the existing and long term problems that our country is facing in the field of agriculture, veterinary & animal science, fisheries, information technology, and other allied fields. Therefore, it is of immense importance for me to make sure that teaching, research outreach activities and training is being imparted efficiently in all faculties of the university. I would also like to see that advancement of learning and applied research is being carried out at the university to produce provide solutions to emerging problems in different fields of agriculture, and other allied fields. My focus would be on academic excellence leading towards: (i) establishing good governance, (ii) introducing Student Centred Learning (SCL) through outcome-based curriculum, (iii) improving teaching-learning and assessment strategies, (iv)increasing physical facilities, student support services, and finally (v) improving research, training and community services. The world of today, the modern Information and Communication Technology (ICT) is playing significant role in providing facilities for the delivery system and quality education. I would try to launch various projects for facilitation of research and quality education, income generating schemes, and the award of scholarship to faculty for higher studies under the University Faculty Development Program, etc. There is no compromise on the quality of education and facilities provided on the campus as we embrace modern technologies with open arms. This university is free from all political unrest until now. Therefore, there is a congenial atmosphere for carrying out research activities by the students and the faculty at this university. The university has a highly-qualified faculty for imparting instructions and providing persistent supervision to the students in the fields of Agriculture, Computer Science Engineering, Business Studies, Fisheries, Engineering, Veterinary and Animal Science, Science, Social Science and Humanities. Our academic programs and services are driven by the needs of our community and economy from a global context. Hence, many of our graduates have been working across the globe with reputation and pride. The university, in future, will continue to enhance the quality of research, introduce subjects having global significance and adopt the state of the art technology and fruitful academic collaboration. I wish all of our learners/students a very bright future. I hope that after getting education at HSTU, our graduates will become assets for the country and would be able to play an important role in accelerating the rate of economic and social development of Bangladesh. Let our dreams come true. I would fully utilize all my energies, experience and potentials to make this university a great seat of learning. I sincerely hope and strongly believe that our experienced and well qualified teachers would facilitate a congenial teaching-learning environment so that need-based, technically and technologically competent and skill-based graduates are produced from this university. I wish all successes, prosperity and welfare of HSTU, Dinajpur.